Garden level of 85 m2 in house comfortable (floor occupied by the owners) ranked 3 stars by the departmental office of tourism, independent access, private garden of 250 m2, exotic wood terrace, loggia. Quiet in flowery garden close to the Pereire Park and its magnificent beach, placed in the most beautiful sites of the pool. Complete equipment for small children (cot, high chair, bath, changing table) Possibility babysitting. On request we can rent and pay 1vélo 2, Table tennis. For occupancy of 2 persons low season outside school holidays see price with owner. Weekend rentals. Bed and breakfast. The bathroom has an area of ​​7,50m2. It has a bath, washbasin, mirror, good lighting, electric towel rail, toilet (for decoration see photo). Loan of crepe maker, cooler for your picnic, board games. We absolutely loved staying at this beautiful homely apartment, it was very French which is what we wanted, located in a very residential area, close enough to the beach (12 minute walk) but with the advantage of a bus stop at the end of the road. A local Epicerie is an advantage, it also stocks very reasonably priced local wines which are excellent quality. There is also a boulangerie beside the epicerie which also has great croissants, but they are not always available. Beautiful area, we did not hire a car as it wasn’t really necessary but if you want to travel about more a car would be beneficial. Great links to Bordeaux, bus to the train station is easy and the 35-40 min train journey is perfect. Very upmarket area, it is not cheap, but would definitely recommend it, just take a lot of Euro with you for the pricey restaurants. Depuis le premier contact jusqu'à notre départ tout c est bien passé. Accueil de la propriétaire très sympathique, logement très confortable avec tous les éléments de confort, très bien situé dans Arcachon. Au grand calme ,le jardin et la terrasse sont bien agréables . Très proche du centre d'Arcachon. A pied, on découvre la ville d'hiver d'un côté et de l'autre la plage de Pereire. Les propriétaires sont très aimables,accueil chaleureux . 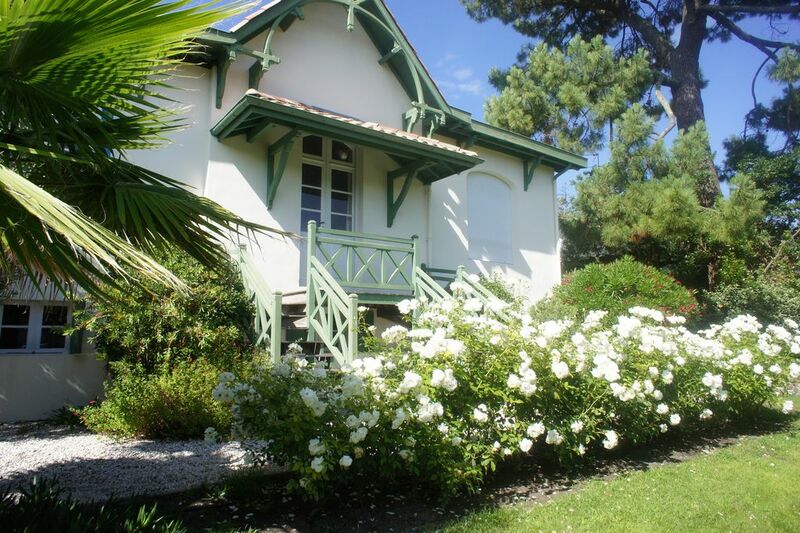 We are located in the heart of residential Pereire -Abatille, which means close to the forest, the most beautiful beaches of Arcachon, bike paths, tennis (200m), thalassotherapy, municipal pool, Basque pelota, the riding center. The city center is a quarter of an hour, but we have small neighborhood shops. The dune of Pila is 10 minutes by car and just after the first ocean beach. Regular boat shuttles take you to the Cap Ferret in 20 minutes.